We see them and cross them on a daily basis but how much do you actually know about Portland’s bridges? This all new AHC talk examines the history, construction, and engineering of the city’s current Willamette River bridges and the structures that preceded them. You’ll learn about some of their unique features and interesting details while presenter John Doyle shares images of current and past bridges. John is a member of the AHC Education Committee and walking tour docent. He also teaches classes with the Portland Underground Graduate School. Parking is on-street (free on Saturdays) or in the parking lot on the west side of Grand Avenue between SE Yamhill and Belmont Streets - just to the north of the Grand Marketplace. Do not use the lot where Dutch Bros. Coffee is located. Thank you to Bolliger and Sons Insurance for sharing their lot with us for our evening and Saturday education programs. 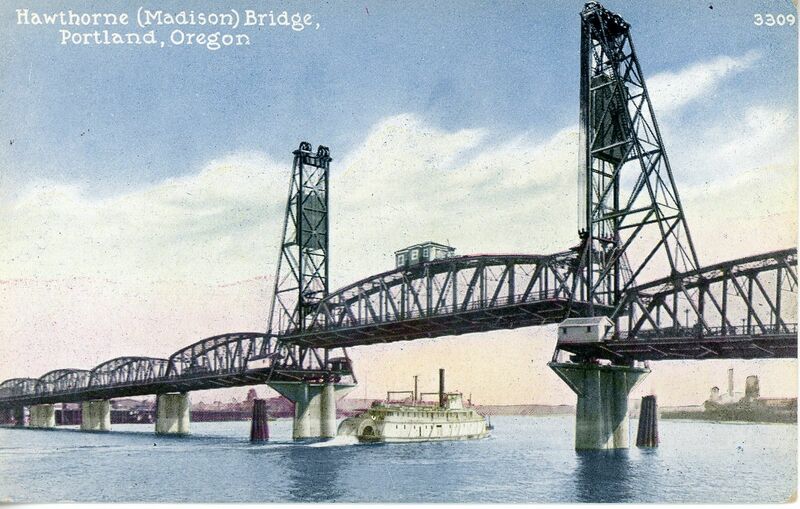 Image: Postcard of the Hawthorne Bridge (c.1910). Architectural Heritage Center library.